Papa doc was Congolese, ebony skinned, bespectacled and immensely dramatic. We just loved him for his occasional constant awkwardness and pure heart. The thing about papa doc is that he has ultimately good intentions. Good intentions that make him want to genuinely extend a hand to friends in need but somehow, lack of planning, a lack of an awareness and respect for time, his overwhelmed life among a host of other unknown factors prevents him from being the truly helpful and optimal version of himself. There seemed to be a constant battle between his ideal and real self. So on one pleasant Saturday, I entrust my precious plans into the loving plans of papa doc and what happens? He disappoints as expected. I once heard someone say that expectations breed disappointment. I gave the saying a thought and decided I was no longer upset being that I was also to blame to an extent for not measuring my expectations. Later that day, he offered to make up by taking me and my friend out to the Chinese restaurant that reminded us of home. Since an invitation to eat together did not directly translate into eating freely, we clutched our purses tightly and sped off in the direction of food with empty bellies and salivating mouths. We imagined the particularly fresh, seasoned and crisp taste of the chicken the restaurant was known for. Contrary to the usually grumpy and burdened waiter who often served us and acted like he was rather paying us for eating at the restaurant, we were met by a rather pleasant waitress who was clad in a neatly pressed uniform. She came up to us and after several negotiations of meaning, including modified Franco-Anglo and Sinophone accents twisted and beaten up in a melodramatic scene, our order was finally taken and our meal on its way. We ate and had a good conversation and expected to go the Dutch way after lunch. ‘Separate!’ My friend and I chanted! In a bit, the crisp sheet that would spell the monetary value of our eating came in. We walked up to the cashier and swiped away. Papa doc remained motionless. Monsieur, its time to pay, let’s go man, aren’t you ready?! Moments later, we arrive home amidst laughter and tears. Papa doc knew he had no money in his pocket, yet, he invited us to wine and dine. We ended up paying for him; in addition to good company and conversation and free gossip. In effect, he did nothing at all in the sense of making up for the earlier inconvenience. All this was too funny…but once again, he was our very own papa doc, so AGAIN, we will let it slide. The house held its breath, the inhalation and exhalation ceased like a noisy TV set that had been muted abruptly. Abrupt, yes that’s the word ; and it hung in the air for what seemed like forever as I actually came to understand and fully appreciate its meaning. Abrupt : definition-Sudden and Unexpected. I was distraught and visibly shaken. My friends had teased in the past about how I sounded like I was laughing whenever I cried ; how I wish this wail would actually transform into a cackle now. He was gone. They returned from the hospital with the remnants of what he possessed; a cell phone, a book bag, a note pad with illegible writing which he kept as a contact book and other things I was too broken to take note of. ‘What happened?’ I asked in between sobs, ‘what happened to him?’ I asked again. ‘He fell’. ‘He fell’ was the inadequate response that returned my question. The cell phone begun to ring and for a minute after the ring subsided, we all sat in silence leaving the phone to lie lifeless as if hoping against hope that somehow its owner would suddenly appear and ask us to hand him his phone. Ghana is a vast country with more than a dozen ethnic groups which in turn have their unique idiosyncrasies and conventions. I am Fante, the year is 2014 and though I believe myself a true daughter of the land, I just found out that ours is a group that has an unwavering respect for the dead. Respect that is palpable enough to make questioning minds uncomfortable and hence my predicament. ‘I see’. Was the curt answer that escaped my lips. The door was subsequently locked and day in day out the mystery of the locked door occupied and assailed my thoughts. How could I avoid it when the door stared back at me no matter which entry or exit point I took in the house? By some twisted fate, it seemed as if the door had also begun to purposefully amplify my fears by looking darker and more imposing than ever. On some days, I wondered if the occupant of the room came by to sleep in. This silly and unexplainable fear of what lay beyond the door was in part influenced by the help who claimed to have heard a distinct shuffling of feet; the same way my grandad used to walk. I dismissed her claims as ludicrous and still went on observing the door; more curious than ever; checking for tell tale signs of any life , activity or occupancy. Over time, my relationship with the door moved from a mixture of curiosity and stale fear to resignation. A kind of resignation that made one throw their hands in the air and accept their unchangeable fate. Whatever I did, the door was here to stay. I couldn’t dismiss the fear and curiosity that gnawed at me. What was I even afraid of in the very first place?! A fear of ghosts? Ha! Who said they even existed? Or Had I read and watched and read too much Harry Potter to the extent that the dementors in the hooded masks seemed real? I was a mess, I yearned to know yet was unable to ascertain my willingness to face whatever it was if it decided to face me. The light flickered on unwillingly after its usual 12hour demise. These were hard times where everything was out of line. Things had fallen apart and mere anarchy had replaced order and sanity. Streets and street corners were filled with ebony black darkness through which the feeble light of a torch could not even cut. Dumsor – Dumsor (or more appropriately dum sɔ) (off&on) is a popular Ghanaian term used to describe persistent, irregular and unpredictable electric power outages. He’d been up scheming all night. His blood shot eyes revealed inadequate sleep and determination. Through the heat and rampant mosquito swatting he’d sat and planned out exactly how he was going to carry out that action. With giant steps he made his way to the bus station. One look at the man’s face told everyone not to mess with him. The bus conductor had only begun calling for the fares of those headed in the church’s direction when the man blurted out the need to turn down the volume of the damned bus radio! The menacing tone of his voice alone coupled with the Crimson red of his eyes told the driver to not argue but do exactly as told. ‘Yes, church stop, a cedi and seventy pesewas’ …. This was the third time the conductor had signaled to the man to pay up his bus fare. The hint of irritation in the conductor’s voice surfaced more than ever before. This forced the silent man to respond. The man did have a gun, a thick ak47, practically the most popular type in Ghana, and was headed for the Church. 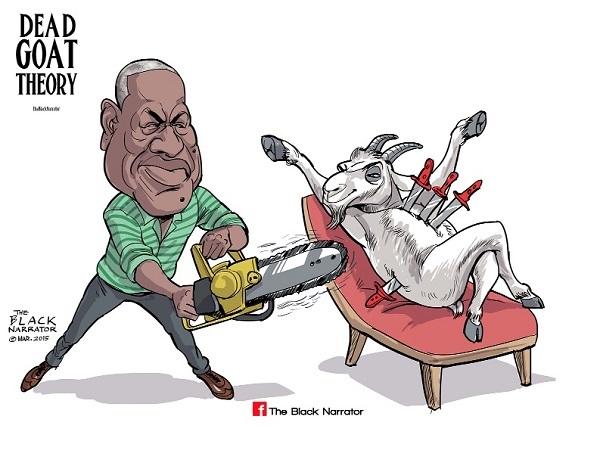 His plan of action was carefully planned and was indeed simple; to give the president three shots in the head; one for the DUMSOR, two for the resultant crippling of the economy and three for his son who had passed away after having received blood that was congealed and contaminated in the hospital refrigerator also due to the same DUMSOR! These were the melange of protests , pleading and counter arguments the mother of the gun man presented. The man’s mother had every reason to cry, her son had just received a ten year jail sentence, one of the fastest rulings ever passed in the Ghanaian courts and all for attempting to assassinate the President. How we wish other matters of national interest that needed legal attention would be handled as fast as this one. ‘I am ready to die!’ He bellows. Like anyone cares I retort mentally as I roll my eyes. People scramble for life everyday in unstable countries and you blatantly stand here and announce your readiness to die. By all means take the lead, and do not forget to remind us to invite beggars to come get ‘small chops’, hoards of sachet water and drinks from your burial thanksgiving ceremony. ‘ I am fifty eight years and have lived a full life; I am not afraid of death! I have absolutely nothing to lose! When Kwame Nkrumah was building the port city of Tema and placing us in sustainable employment in factories where were you? !’ He continues these rants for what seem like a decade amidst spittle, sweat and foam that gathers at the sides of his lips. This foam! Eww! I can’t stand this foaming. The sight of it makes me sick and I will Myself to clear the image from my graphic mind lest it reappear while I eat later in the day. He freezes as he clutches his antiquated iPhone 3 even tighter.